Ever been in a virtual meeting where something was being decided? How did it go? Perhaps it started with some discussion, maybe someone shared some slides with graphs or data, people talked for a while to present different points of view, and someone finally said, “It seems like we should do x and y and then z.” And, almost always, right after that someone asks the absolute worst question you can ask in a virtual meeting. On the surface, it seems like a simple, even straightforward question. It seems to ask what we really need to know: Are we in agreement? Have we reached a decision? Can we end the meeting and go our separate ways, knowing we are aligned on this one? That’s the information you actually want. “Does everyone agree?” is simply poor shorthand for all of that. When someone asks this question in a face-to-face meeting, you can at least scan the faces of those around you to look for obvious signs of discomfort, disagreement, or confusion. In fact, I’ll bet that’s your first reaction when someone asks this. In a remote setting, you get a lot less information from doing that, even if everyone is visible on video. So you have to rely on what people say in response. However, there is no possible way to respond to this question that accomplishes anything useful. First of all, we can’t know what everyone else thinks without hearing from them individually. We all realize that, but we also know that if we stay silent, there will be an embarrassing pause, so we often speak up. The people who really do agree tend to speak first, because it’s generally easier to express agreement than dissent. So you hear a bunch of “Yes!” responses from those who are satisfied and/or just want the meeting to end. Then keep quiet yourself for a minute to give people time to frame a response. My favorite trick for this is to take a leisurely sip of my beverage right after asking the question, and then keep quiet until I’ve carefully placed my cup back down on my desk. Works every time. Do make sure you allow enough time to actually discuss anything that comes up. If you don’t, people will quickly catch on that you’re really asking, “We all agree, right?” and they won’t bother speaking up. It may extend the discussion a bit, but that will pay off in stronger alignment at the end. Posted in everything. Tagged with remotecollaboration, virtualmeetings. How do I manage a quick check in during a Zoom meeting when some people are co-located in one (physical) room, some are in their offices, and some are on the phone? And I have a paper list of names, but not sure who’s actually attending? We’ve met everyone and they all know each other, but I want their voices in the virtual room. Blended meetings are tough. It’s a lot easier to pay attention to someone right next to you than to a voice on the phone. Setting the tone with an inclusive check in is a great way to bring the remote people into the room—or bring the in-room people into the virtual setting, depending on your point of view. Ahead of time, ask an in-room partner to bring in a bunch of interesting, small objects. Have each in-room person select an object. Ask each remote person to look around their space and select an interesting object. For the check-in, each person shows their object to the camera or describes it aloud and says why it connects with them at this moment. Have each person describe the local weather where they are and then share their internal weather state (stormy, calm, sunny, frozen…). The in-room group only needs to describe the outside weather once for everyone there, and then each person can share their individual internal state. Ask each person to use a marker to draw a circle on a scrap of paper, then fill it in with eyes, nose, and mouth to create a simple drawing of their mood. Under the circle, have them write their name. Each person holds up the drawing to the camera, says who they are, and says something brief about their mood drawing. It’s also essential to make sure that the remote folks are never overlooked throughout the course of the meeting, so anything you can do to give the in-room people a way to imagine something real about the remote people’s surroundings will help. This is one of my favorite ways to bring remote people into a room where several others are gathered. I’m assuming that the facilitator is in the room with some participants and other people are connected from their individual locations, but this works if the facilitator is remote and has an in-room partner, too. Bring a stack of table tent cards to the meeting and set them out for the in-room people to write their names on. Recruit an assistant in the room to be your virtual liaison. As people are getting settled, have your assistant get the remote people’s names on additional cards. Make sure that each remote person is represented on a separate tent card. Set the remote people’s tent cards in a ring in the center of the table, or place them between other people’s chairs, so they are present at the table. When you go around for check ins or other round-robin responses, include the remote people by reading their names from the cards. For groups that meet this way routinely, you could assign a remote card to each in-room person and have them be accountability buddies with their remote counterpart. Buddies are responsible for ensuring their remote person gets copies of documents during or after the meeting (texting images of visual captures at critical points or getting the remote buddy’s ideas onto sticky notes, for example). Obviously, this has limitations if the number of co-located people is large. In that case, I try to get someone in the room to tell me who is there and keep me informed as people arrive and leave, and I use an old-fashioned list on paper. What are your favorite ways to be inclusive in blended meetings? Posted in everything. Tagged with facilitation, virtualmeetings, webconferencing. I’m delighted to announce a project that’s been underway for several months now: a new online workshop developed in collaboration with TeamCatapult called Virtual Team Facilitation. The workshop is hosted by TeamCatapult and will be co-taught by their CEO Marsha Acker and myself. It’s offered in a two-day online format and includes a mini team intensive that gives participants an opportunity to really practice what they’ve learned. The workshop focuses on creating and facilitating effective team engagements in virtual settings. It’s different from my current Grove workshop Facilitating Virtual Collaboration in that the new workshop is framed within the context of agile teaming methodology and taking agile practices into virtual settings. Some experience with agile team facilitation is required. We review key tenets of agile facilitation but don’t cover it in depth — TeamCatapult has another course for that. 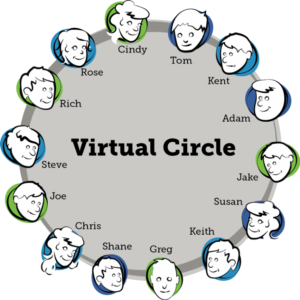 Learn more about Virtual Team Facilitation and/or register here. Posted in everything. Tagged with collaboration, remotecollaboration, teams, virtualmeetings, workshop. In today’s FVC (Facilitating Virtual Collaboration) workshop, the topic came up about how facilitators can engage participants in a remote meeting so that they don’t check email, tune out, stop listening, and fail to … well… participate. My unusual and occasionally unpopular advice: It’s not entirely your problem. Posted in everything. Tagged with facilitation, remotecollaboration, virtualmeetings. A project I’ve been working on for three years is tantalizingly close to completion… it’s a book! The working title: Beyond Virtual Meetings. I think the world would be a better place if people could work together more effectively at a distance. Based on experience and observation, I’d say that working with a remote team can be pretty painful and frustrating… but it doesn’t have to be. So that’s what I’m writing about: how you, as a team member, team leader, or facilitator, can make remote collaboration better for yourself and everyone you work remotely with. The Grove recently published a short interview in which I talk about some of the main themes. Writing the book itself has been an interesting process, sometimes fun, sometimes painful; just like writing any book, I imagine. At this point, the manuscript is complete and I’m doing an editing pass to tighten it up. We don’t have a publication date yet but I’ll post it when we do! 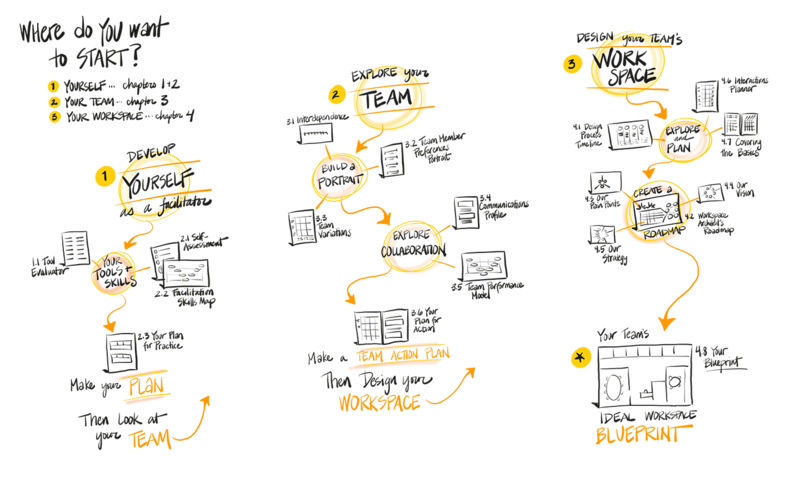 The current draft has three parts: the first, illustrated here, is about being facilitative in online settings, finding out what your team needs most, and creating a beautiful virtual workspace to support collaboration. The second part includes agendas and checklists for doing virtual work (both in meetings and in between meetings, when lots of important work happens too!). The third part is a collection of 70 best practices for yourself and your teams to make remote collaboration smoother, easier, and more effective. Want to stay informed? Sign up to be notified when the book is ready. If you think this book will be helpful, I’d love it if you’d leave a quick comment saying so. Thanks! Posted in everything. Tagged with collaboration, remotecollaboration, teams, virtualmeetings. 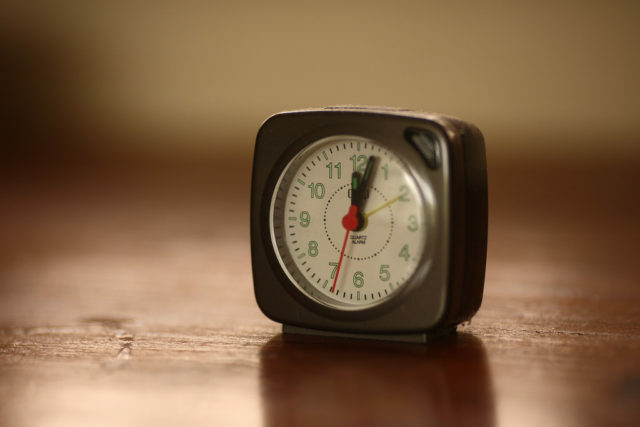 How long does it take to get things done in a virtual meeting? One of the most common mistakes people make when planning virtual meetings is allocating time incorrectly. Hint: the problem is not usually that meetings end early. 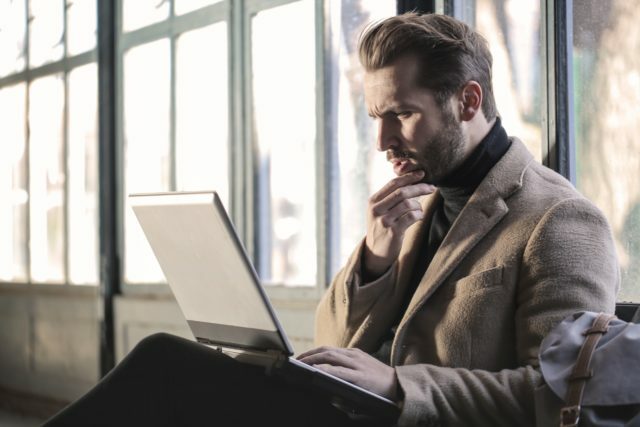 To help you avoid this error, here is a handy formula you can use to calculate how long something will take in a virtual meeting. How long would this conversation with this group of people take in a face-to-face meeting? Write it down. We’ll call that number n.
If there is no facilitator, double n before continuing. Then hire or assign a facilitator. For 11-15 people, add 5 minutes to n.
For 15-20 people, add 10 minutes to n.
For 21-30 people, add 15 minutes to n.
For more than 30 people, design pre-work to take care of as much as you can before the meeting, then add 20 minutes to n.
Will you be switching tools during the meeting? For instance, going from screen-sharing to a collaborative sticky note board, Google doc, or similar? If so, add 5 minutes for every time you switch to a new tool. If the additional tool is new to at least half the group, add another 5 minutes. If the additional tool requires participants to log in, add another 2 minutes. If the additional tool requires a download or plug-in, add another 5 minutes. If you don’t display clear written instructions about how to access and use the tool, add 5 minutes. 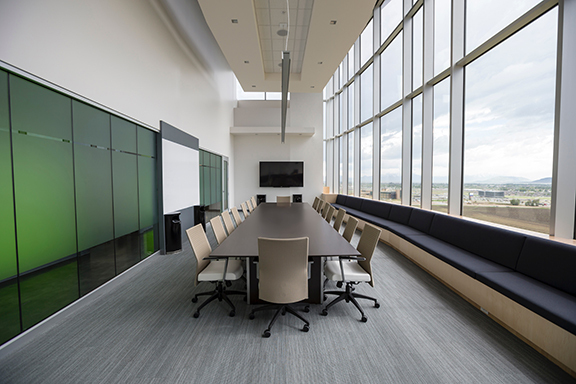 Will you be using breakout rooms in this meeting? Add 5 minutes for each time you go into breakouts. Will the group need to make a major decision during this conversation? For groups up to 15, add 10 minutes to propose the decision and check for agreement. For groups of 16-20, add 15 minutes to propose the decision and check for agreement. For groups over 20, add 15 minutes to propose the decision and check for agreement, and expect a lot of follow-up questions after the meeting. If the group is very divided about the content of the decision, add another 5-10 minutes to the decision time. Will you be keeping a Parking Lot, and do you expect more than two Parking Lot issues to come up? If so, add 5-10 minutes to resolve the Parking Lot issues. Look at the total you have so far. For every 60 minutes, add 5 minutes for stretch breaks. If you’re over two hours total, add another 10 minutes for a sanity break in the middle. Remember to add 10 minutes up front for people to connect to the meeting and get their audio and video sorted out. Remember to add 5 minutes at the end of the meeting to review decisions and action steps. As an example, let’s look at a group of 14 people who need to brainstorm ideas about their next product launch, select two, and assign research leads to each idea. It would take them 45 minutes to get this done in one focused face-to-face meeting with a facilitator, so n is 45. Boardthing doesn’t require an account or a download, so we don’t need to add any time for that. Naturally we will create clear, visual instructions for Boardthing and show them before we switch as well as in Boardthing itself, so we don’t have to add 5 minutes for not doing that. The group isn’t particularly deeply divided, so we don’t need to add time for that. We don’t expect a long Parking Lot, so we don’t need to add time for that. In order to accomplish our objectives in a virtual meeting, we need to set aside 90 minutes, including a 5-minute stretch break. By now you’re probably wondering whether this is meant to be satire. Nope. I’m serious. This is how long it takes to do real work when you’re not face-to-face. If you plan for it and people are prepared in advance, the meeting will run much smoother. People will feel great about achieving their objectives in the time they set aside. And hey, if you’re wrong, you can always end the meeting early. In my Rules of Order for Virtual Meetings (first installment, rule B1), I recommend looking at the camera on your computer or device rather than looking at the video window of the person you are talking to, in order to simulate eye contact. Weird for you, much more natural for them: from their point of view, you are looking directly into their eyes. From yours, though, you’re looking at a tiny light and there’s lots of distracting stuff in your peripheral vision. I received this photo today from Brian Tarallo, a colleague who took that advice and ran with it. To help himself remember to look at the camera (and probably feel less weird while doing it), he created a little paper avatar. Look closely and you’ll see a hole punched out where the avatar’s right eye should be. That goes over the camera, so the camera is ‘looking out’ from the avatar’s eyes. Brian can look at the friendly little avatar — which gives him a face to talk to — and make perfect eye contact. 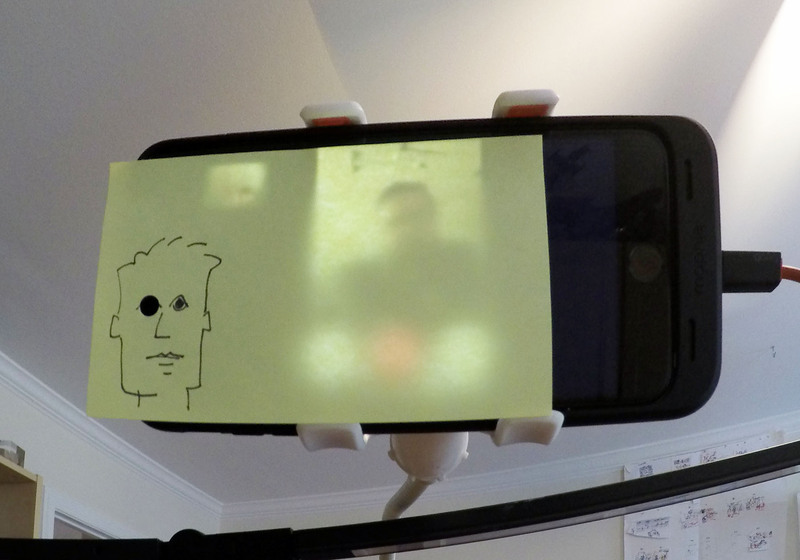 In this case, the paper is a sticky note attached to his mobile’s screen so that the hole remains over the camera. The same idea could be applied to any webcam where the camera is close to the surface of the screen (like Mac laptops and desktops). Look ’em in the eye! Photo courtesy of Brian Tarallo. I just love it. What an elegant solution! It might be trickier if you’re using one of those eyeball-shaped USB webcams, because it might be hard to get the hole to line up with the camera in a way that doesn’t cause the paper to obscure the camera’s view. But smartphones, tablets, and computers with built-in cameras should work just fine. Thanks, Brian, for allowing me to share your idea and photo, and Ben Tinker for being the guy behind the sticky. Posted in everything. Tagged with remotecollaboration, video, videoconferencing, virtualmeetings, webconferencing. Last week, my colleague Malgosia Kostecka and I co-facilitated a challenging four-hour remote meeting of 33 attendees in 22 locations involving complex work: developing a mission statement and the initial five-year vision for a new organization. This meeting kicked off a five-month process to explore different models for how the organization might be structured. Over the summer, sub-groups will design possible models and prepare to present them to the whole group. The process will conclude in October with the group’s first face-to-face meeting, where the final mission, vision, and five-year strategy will be set. These will then be used in securing approval to launch the organization. For this kickoff, we used Zoom, Boardthing, and Slack as our workspaces. I’m happy to report that it went well. Astonishingly well, actually, given that I always assume something will go horribly wrong! We barely needed Plans B and C and didn’t reach Plans D or E at all. Here’s how it worked. We worked closely with the meeting sponsors to identify outcomes and understand who would be in the meeting. We set up Slack for the whole team, since they will be doing ongoing work throughout the summer. The ongoing setup includes channels for smaller working groups, plus one for questions, general information, and workgroup chairs. Special temporary channels were also set up for the meeting (see Plan C, below). We set up a Zoom room for the main meeting space. We created a Boardthing board for collecting and sorting vision ideas. Advance setup included creating a list of instructions, uploading a template image for sorting the ideas, and preparing an agreement scale in case we needed it. We prepared 14 digital templates covering each part of the meeting from the Do-Now to Closing Thoughts. Not all were used, but they were ready! We created a spreadsheet to track who had signed in to Slack, who had done the tech check, who was to be at the one co-located venue, and who would be in each breakout discussion group during the meeting. We took into account the 11 people who would be connecting from a single location when planning breakout groups. We prepared a visual roadmap of the entire process, from this kickoff meeting throughout the summer and fall to the final group meeting scheduled in October. We prepared the agenda (a detailed facilitators’ version and a more general participants’ version). We prepared a text document with participant names and email addresses, key web links that would need to be copied and pasted, and a few technical support statements that we would likely need to paste multiple times. Prior to our involvement, participants went through a selection process based on interest, expertise, and availability. There were also initial discussions about the process and its outcomes. We asked participants to sign in to the Slack team space prior to the meeting and to have Slack open during the meeting itself. They were also encouraged to attend a brief tech check to make sure they could access Zoom. As mentioned above, we used Zoom, Boardthing, and Slack; additionally, I used Autodesk Sketchbook, a spreadsheet, and a text editor. We used a countdown timer to time breaks. The planned timing is on the agenda image here. The actual timing is noted in parentheses next to each activity below. Our agenda. Organization and other names have been removed. Once everyone was settled and had had a chance to work on the do-now, the sponsors opened the meeting by setting the context for the work this team will be doing, why do it now, and why the team was comprised of these particular people. I introduced myself briefly when I took over, and ran through the outcomes, agenda, roles and rules as shown above. I left space for additional rules but the group didn’t add any. I mentioned the backchannels (Slack and the chat feature of Zoom) and encouraged participants to speak up in those channels if they were having trouble. Malgosia was monitoring both channels throughout the meeting. We asked people to turn off their video cameras while they were in the full-group session and said they were welcome to use them in the breakouts later. Since this group is not an intact team but a group of colleagues from different organizations, we invested some time in team introductions. Using a prepared template that showed six ‘tables’ — one for each of the working groups that will meet over the summer — we went around the virtual room. Malgosia and I modeled what we were looking for with our own introductions first. Each person’s name was already written in, along with his or her organization. When it came time to speak, each person said who they were and where they worked and also shared one hope or expectation for the process. I added each person’s hope/expectation to the template as they spoke, using Sketchbook and my Wacom Cintiq pen display tablet (it’s like the 27HD but mine is a 24HD). We placed the project roadmap on the screen and walked through it to be sure the five-month process was clear. Facilitators and meeting sponsors/workgroup chairs answered questions as they arose. After that, we took a five-minute stretch break. I placed a countdown timer on the shared screen to time five minutes. After the break, we shifted to developing a draft mission statement. We started by reviewing mission statements from four or five well-known organizations (selected in advance and written on a template). Next, we explained the process we were about to use, as well as the backup plan should our initial plan fail (see Backup Plans, below). We answered questions (all this took a little less than 10 minutes) and then got started. Whenever they worked in breakouts, we checked in with each group periodically to make sure that everything was going well. We ended that segment with three possible mission statements, agreeing to finalize the new organization’s mission in October. At this point we were halfway through the four-hour time, and we took a 20-minute break to stretch, wolf down food, adjust any technical glitches, and so on. Once again I shared the countdown timer. After the break, we briefly reviewed the agenda to check in with the process and our progress. Then we shifted to working on the vision. We opened with a guided imagery activity, set five years in the future. We set the context by saying that five years had passed and the organization was very successful. Then, everyone listened and imagined, but did not answer or speak, as we asked the following questions: What activities are happening throughout the year? Who is involved? What are the media saying? What publications and resources exist that didn’t before? How is your work different now? Everyone was then given five minutes to jot down some ideas that had come to them during the visioning. When that was complete, we saved it and uploaded it to Slack right away so that everyone could use it during the next activity. Once everyone was ready, we pasted the Boardthing link into the Zoom chat and into Slack and asked everyone to open it. While they were doing that, we placed them into breakout groups of about six people (the 11 co-located people formed two groups where they were). While they worked, we checked in on each breakout to make sure that everything was going well. After that time, we gave everyone else a 5-minute stretch break (using the timer). Meanwhile, Malgosia and I took an initial pass on the cards, grouping them into rough clusters and proposing cluster names. When the group returned, we had six or seven theme categories and three or four cards that we weren’t able to place in groups. After the break, we reviewed the clusters and asked for corrections or changes. We refined the cluster names and added the loose cards to clusters with the group’s guidance. We copied the seven cluster heading cards and placed them into the vision template in Boardthing. The group discussed and refined the vision elements further, adding nuances and making distinctions, until they were happy with the draft vision. We did a brief and informal check for alignment, and declared victory! We briefly brought back the process roadmap and reviewed it again, answering new questions. The sponsors outlined next steps, thanked everyone for their involvement, and closed the meeting — on time. Well, almost. We were two minutes over. After the meeting, we created a PDF file containing all the meeting charts, including screenshots from and a link to the Boardthing board, sent it to the sponsors, and uploaded it to the team’s Slack space. Now we are in the process of planning and scheduling the series of smaller remote meetings for each of the six working groups that will take place over the summer. When I create a backup plan, I pick the thing that is most likely to go wrong, imagine what will happen if it does, and come up with a workaround. I keep doing this until the only remaining workaround is for everyone to talk normally on the phone while I take notes on paper. The backup plans for this meeting centered on people not having access to Zoom, or the Zoom breakout groups not working, since those were the trickiest parts of the meeting. Plan A: The meeting as designed and described above, and basically what we did. Plan B: Assuming people couldn’t see the screen but could connect to Zoom via the phone, they would be paired up with a ‘screen buddy’ who could help them create Boardthing cards. I also read everything that was on the templates and described each new one briefly as I brought it up. Plan C: Plan C covered us if the breakout groups in Zoom failed. In every meeting, there are always a few people who can’t get into the breakout rooms, and I have yet to figure out why. If it’s just a few, then I leave them in the main room and they become their own breakout group. If it’s a lot, then we are into Plan C. To prepare for Plan C, we created temporary channels in Slack for each breakout group and invited those people to each channel. The instructions to the group were that if the Zoom breakout wasn’t working, they were to have their discussions via text in the Slack channels instead. We only needed to do this with one group once. Plan D: Plan D assumed failure of Boardthing, or failure of people to get into Boardthing. In this case, I would have brought it up and shared my screen and we would have talked through the process, perhaps collecting ideas in Slack and having Malgosia read them to me to type in. Luckily, we didn’t need to do this. Plan E was the last-ditch backup, where we do the whole thing in full-group discussion while I share my screen and do graphic recording. I learned a LOT about Zoom breakout rooms in this meeting. One thing I should have taken advantage of more is the ability to set breakout groups up in advance and then re-use them. If I had done that, it would have greatly simplified (and speeded up) the process of getting people into breakout rooms. Instead, I created different groupings on the fly based on lists in our spreadsheets, which got a little complicated and took some time to set up. Astute readers will notice that in steps 4 and 6 in particular, we lost a few minutes of work time getting people into the breakout rooms. On the whole, though, I’m happy with how it went, and I’ve heard very positive feedback from the participants and sponsors as well. Need a Good Remote Meeting? Do you need to get work done with a remote group? I’d love to help. Contact services@grove.com to set up a time to talk about what you need. Posted in everything. Tagged with collaboration, facilitation, grove, remotecollaboration, virtualmeetings, webconferencing. The first and second posts in this series covered rules for orienting to purpose, connecting people, drawing out information, and getting closure on commitments — the first four stages of The Grove Facilitation Model. This post, the last in the series, deals with Videoconferencing Rules of Order for the final three stages: supporting action, monitoring progress, and leveraging learning. A future post will go into more detail about the Model itself. For now, if it’s unfamiliar, just think of it as a set of lenses that a facilitator can use to plan and handle group processes. When the videoconference is humming along and people are embedded in the work of the meeting itself, it seems like the safest thing to do is to sit back and not mess with it. But there are still some small things you can do to make it easier for everyone to work together via video. Give participants something to focus on besides each other. Share a screen showing a visual map of the work process or other materials that are not text-heavy. 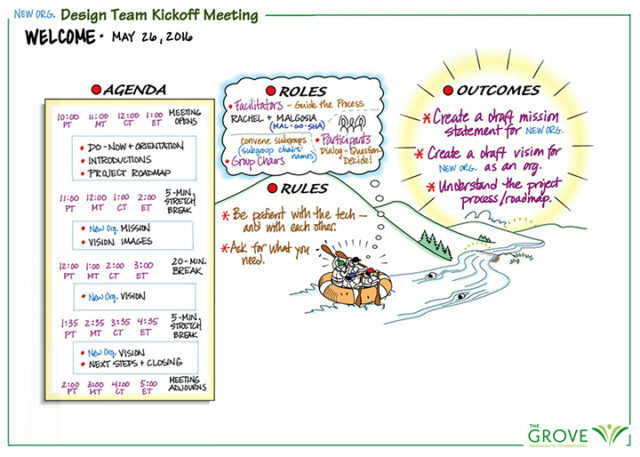 Bring in a digital graphic recorder to capture the meeting in real time on a shared screen. Create a simple template in PowerPoint and complete it while the group talks. Having a visual representation to discuss and refer to helps to keep the conversation on track. People find a bit of variety stimulating and engaging, so don’t use the same technique every time. Give participants something to do. Use other tools in combination with video. Set up a shared spreadsheet where participants can take a few moments to reflect and type answers to relevant questions, or give their opinions of different options. Once everyone has had a chance to reflect and respond, use the document as a springboard for discussion. Or get everyone into a shared sticky-note board and have them create and interact directly with digital sticky notes. After I posted the first in this series, Nora Rubinoff added some excellent rules of order in a blog post of her own that I would also classify under supporting action. When the group is working, the facilitator can keep the meeting flowing with light touches as they would do in a face-to-face meeting. Keep an eye on body language, but not the way you’re used to doing it. On most video conferences, you can only see people from the shoulders up. It’s easy to miss signals that would be obvious in a face-to-face meeting. Watch for signs of fatigue or distraction: looking down often, repeatedly or persistently looking away from the computer, frequent nodding without contributing, leaning the head back onto the top of the chair and looking at the ceiling, fidgeting. These can all signal that patience has run out and it’s time for a quick stretch break. Also watch for quiet people trying to break in to the conversation, and help make room for them. They may suddenly look alert, sit up straighter, or start to open their mouth and then close it again if there isn’t space to talk. Call on them by name and ask if they wanted to say something. Narrate your actions when you do something that appears to be a distraction. If you need to pull up a document, for instance, or look for a relevant email pertinent to the task at hand, say so. “I’m going to pull up the email that has our agreements from last time. It will only take a moment and I’m not reading any new messages right now.” Otherwise, your obvious shift in focus will be taken as an invitation for everyone to check their messages and the meeting will lose momentum. Bring the agenda back on screen each time an item is completed. In face-to-face meetings, we tend to keep the agenda posted all the time and refer to it throughout the process to keep people oriented and on track. With videoconferences, it’s easy to lose sight of progress because the agenda is displayed once at the start of the meeting and then never again. Instead, share it on the screen, annotating and updating it if possible, each time you shift from one topic to another. Even if you’ve sent agendas to everyone beforehand, it’s helpful to do a quick group check in now and then. The activities that fall under the category of Leveraging Learning are often dismissed as ‘extras,’ things that are nice to have but not necessary in our time-pressured workdays. However, they do not need to take a lot of time and the payoff in participant satisfaction, productivity, and engagement is huge. Spare a few minutes for practices like these that get everyone involved in the group’s choices and success. Take a moment at the end of the meeting for “likes and wishes.” Invite each participant in turn to share one thing they liked about the way the meeting worked, and one thing they wish for next time. You can leave it open in terms of scope or frame it so that people are reflecting on the technical aspects of the engagement. In settings where people are not inclined to speak openly about what they would like to change, set up an anonymous way to contribute, such as a shared sticky-note board or shared document. Use the feedback to adjust future video meetings. Take screen shots at various points in the meeting. Combine them with images of charts created by digital graphic recording and links to documents jointly edited during the meeting. 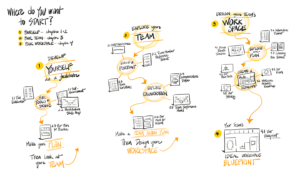 Share this output with participants via email soon after the meeting as a visual record of their virtual time together. Host occasional pop-up sessions dedicated to reviewing the technology you use for video, shared editing, and other meeting functions. Invite interested participants to prepare short presentations of new tools that show promise, or ask volunteers to try out specific tools and report the results. Keep your group’s tech fresh by sharing the responsibility for finding, testing, and proposing new tools. Although synchronous meetings are only a small part of remote work, they provide opportunities to build relationships and cement commitments among distributed colleagues. Using these guidelines will help you make the most of your team’s remote gatherings, bring team members closer together, and increase their effectiveness as a distributed team. Posted in everything. Tagged with collaboration, facilitation, remotecollaboration, teams, video, videoconferencing, virtualmeetings, webconferencing. Last week, I wrote up a few Rules of Order for Videoconferences, focusing on reducing disorientation and on building connections with people. This post continues the list and proposes rules for having fruitful discussions and helping participants come to agreement. These ideas are pretty useful in any kind of meeting, not just videoconferences. I’m dividing the Rules of Order for Videoconferences into the stages of the Grove Facilitation Model, shown here, in case you’re curious about my categories and where this is going. More about the model later. The Grove Facilitation Model v. 5.0. © 2006, The Grove Consultants International. Ask good questions. Instead of following someone’s comments with a statement, try following with a question that invites them to say more. Or, rephrase back to them what you think you heard them say, to check for understanding. It’s often difficult to feel connected to people in video conferences. Asking good questions demonstrates that you’re paying attention and makes the speaker feel like you are really connecting with them. Be okay with some silence, especially after you ask a question. Silence can feel awkward, particularly on a video call. You ask a question and then nobody says anything, and everyone is just sitting there staring at you! So you start talking again to dispel the awkwardness. Don’t! What’s actually happening in that moment is that people are gathering their thoughts. Introverted thinkers in particular are framing what they want to say. Just sit and look relaxed and interested (even if you are privately freaking out) and leave an inviting space for others to fill. They will. Reflect agreements back to the group. There are lots of ways to do this, but if you’re in a videoconference, use what you’ve got. Keep a big marker and blank paper sheets handy. When an agreement is reached, write it down in large, clear letters and hold it up to the camera. (You might want to make sure your camera doesn’t reverse your image — but test with a friend, because some software shows YOU a mirror image of yourself even though other viewers see you correctly.) Give everyone a moment to read it and ask if it’s accurate. At the end of the meeting, run through them all again, then follow up with an email stating the agreements. Check for consensus explicitly. We’ve all been in meetings where the convener says, “Everyone in agreement? Yes? Great, let’s move on.” Wait, what? When was I supposed to consider, let alone voice, my level of agreement? Don’t mistake silence for agreement in videoconferences. Try introducing a simple agreement scale (see below). Ask everyone to write the scale down, or email it to them ahead of time. When you need to check for agreement, have everyone review the scale and hold up the number of fingers or otherwise indicate their level of agreement. Recall that consensus can mean no one is vetoing, though for more important decisions you might set a higher baseline of agreement. Allow responsible parties to state their own commitments. In the interest of time, it can seem expedient for one person to run rapidly through a list of who said they would do what. You’ll get more follow through if you give everyone a moment at the end of the meeting to state for themselves what they have agreed to do. It gives you a chance to address any misunderstandings or unclear action steps, too. The next post will cover Rules of Order for supporting action, monitoring progress, and leveraging learning. As always, remember that any ‘rules’ I share are like the Code of the Pirate Brethren: more guidelines than actual rules. Posted in everything. Tagged with remotecollaboration, videoconferencing, virtualmeetings, webconferencing.